Synonyms: AnoHana, We Still Don't Know the Name of the Flower We Saw That Day. Ano Hi Mita Hana no Namae wo Bokutachi wa Mada Shiranai. reunites the lead production staff of the 2008 anime series Toradora! It was first teased in December 2010 as a joint production of Aniplex, Fuji Television, and animation studio A-1 Pictures under the title AnoHana Project. The series is set in the city of Chichibu, Saitama Prefecture. The first Blu-ray volume, which went on sale on June 29, 2011, sold more than 31,000 copies in the first week of release. At the time, that first week sales figure was the third highest for a first volume Blu-ray release of a television anime, after Mahou Shoujo Madoka★Magica (2011) and K-On! (2009). AnoHana received a Jury Selection award in the Animation division of the 15th Japan Media Arts Festival. A visual novel adaptation for the PlayStation Portable, which diverges from the story of the anime and contains an original ending, was developed by Guyzware and published by 5pb. on August 30, 2012. AnoHana was also adapted into a special live-action television drama, which aired on Fuji Television on September 21, 2015. Adaptation: Ano Hi Mita Hana no Namae wo Bokutachi wa Mada Shiranai., Ano Hi Mita Hana no Namae wo Bokutachi wa Mada Shiranai. Dealing with the death of a friend or loved one isn't easy, no matter how old you are, and everyone comes to terms with their loss in different ways. Adults can drink themselves into a stupor in an effort to dull the pain, take off on a journey of self discovery, bury themselves in their work, or find some other coping mechanism. Unfortunately the same isn't true for children, and all too often they are unable to truly deal with the emotional turmoil that occurs. Now it may seem a bit odd to talk about death, grief, and learning to deal with the loss of someone close, but essentially that's what Ano Hi Mita Hana no Namae wo Bokutachi wa Mada Shiranai (We Still Don't Know the Name of the Flower We Saw That Day), is all about. The story opens with Yadomi Jinta, a seemingly grumpy teenager who is playing a game in his room on a hot summer's day whilst his childhood friend Honma Meiko (Menma), pesters him repeatedly. Having had enough of the game, Jinta decides to make lunch, but only for himself and his father which annoys Menma no end as she also wants to eat the ramen he has made. On the surface AnoHana looks like a fairly straightforward tale of teenagers learning to deal with a past trauma and maturing in the process, and for the most part that's a fairly accurate perception. The plot is well constructed and takes a measured, almost methodical approach to events which is reflected in the often placid tone of the narrative. Unfortunately this leads to a degree of predictability as certain events in the storyline are clearly foreshadowed, and while the series promotes a degree of empathy for the characters and their situation, there may be occasions where viewers want the story to get to the point. One surprising aspect is the manner in which flashbacks are used to punctuate specific occurrences or emotions, whilst adding historical context to the relationship between Jinta, Menma, and the rest of the "Super Peace Busters". These sojourns into memory act as a nice counterpoint to the current state of relations between the characters, and highlight just how much has changed for each of them over the last ten years. This contrast is also reflected in the visuals, and while there is a marked difference in the appearance of almost all of the Super Peace Busters, it's actually the subtle contextual setting that makes the change much more pronounced. The key thing to remember is that people often romanticise personal history and memories, especially if one has undergone some kind of trauma, and AnoHana plays on this by sharpening the focus and darkening the tones on the present day, which contrasts with the soft focus flashbacks that are often filled with "light". The design itself is well handled, but while efforts have been made to really highlight the changes ten years can make to a child's physical growth, it's the character animation that stands out. A-1 Pictures have tried to visualize the movement differences between a child and an adolescent, and while there are a few niggles here and there, the overall effect promotes the sense that the characters are no longer the children they once were. Because AnoHana is a character driven piece there is a heavy emphasis placed on the dialogue, and while the majority of the script is actually pretty intuitive, the manner of speech during the flashback scenes can sometimes seem a bit odd. Thankfully the series has some very talented seiyuu on hand, and it's interesting to note that some of the roles feature two different voice actors - one for the present day and one for the past. Each role is given due care and attention, so it's unfortunate that even with so much talent on hand, there are a few issues from time to time as the seiyuu handling the child roles are all adults. Now while this may be standard practice in the industry, studios like Ghibli have proven time and again that children are much more capable of playing the younger roles than the majority of adults, and while the relatively minor flaws in the dialogue do stand out, one has to wonder how different the series could have been if child actors had been used. 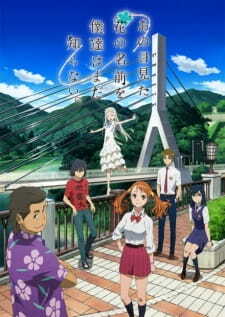 AnoHana features a number of slow pieces of background music performed on piano or guitar that reflect the measured plot and add a slightly bittersweet air to the storyline. The opening theme, Aoi Shiori by Galileo Galilei, features a sequence that shows the characters in their past and present forms and hints at the the reason for their emotional difficulties. The ending sequence features a montage of the three girls of the Super Peace Busters, Menma, Anjou Naruko (Anaru), and Tsurumi Chiriko (Tsuruko), and is set to Secret Base ~Kimi ga Kureta Mono~ (10 years after Version), which is a cover of the 2001 single by Zone and is performed by Kayano Ai, Tomatsu Haruka and Hayami Saori, the seiyuu who play the roles of Menma, Anaru and Tsuruko. Now given the nature of the series and the near constant focus on the characters, certain viewers may assume that AnoHana should feature almost continuous development, so it may come as a surprise to some people that the show takes more of a "stop-start" approach. Because of the attempt to apply a degree of realism to the characters and the emphasis on depicting them as plausible, any attempts at continuous development would seem overly contrived. Balancing that though, is some rather strong characterisation. One of the key things to remember about each person in the story is that they have experienced a specific defining moment in their lives, and that allows the characters to be depicted as individuals from the start. The strength of the characterisation is even more palpable if one compares the present versions of the Super Peace Busters with their past selves from the flashbacks. That said, there are occasions where the story has difficulty finding a resolution to a given situation so it can sometimes seem as though events are being dragged on in a effort to develop the characters. AnoHana is a surprisingly simple, yet slightly over sentimental, look at the coping mechanisms of children and adolescents when coming to terms with a past trauma, and in that respect it's one of the more surprising titles of the last few years. The series errs more on the side of soap opera than outright drama from time to time, but like many of the other relatively minor flaws, this can be forgiven in light of the fact that the subject matter is well managed and delivered. In truth, the closest neighbour to AnoHana would probably be Tokyo Magnitude 8.0 as that also highlights the difficulty children have in dealing with the sudden loss of a loved one. It's difficult to say whether I actually enjoyed the series or not. On the one hand it has some genuinely entertaining moments, but on the other the series deals with an issue that has little enjoyment value (unless watching kids coming to terms with emotional scars is your thing), and even though AnoHana isn't a story without flaws, that doesn't mean it's bad. In fact, the reverse is true as while the series does take a slightly romanticised look at the characters and events, the constant element of realism that runs through the narrative sets this anime apart from many others. If nothing else, AnoHana is a great example of how good a completely original anime can be. Moderator Edit: This review contains spoilers. ''Ano Hi Mita Hana no Namae o Bokutachi wa Mada Shiranai'' (We Still Don't Know the Name of the Flower We Saw That Day) is a series that sets lofty goals for itself. It is, in essence, a ghost story that aspires to be a poignant drama about (unrequited) love, loss, adolescence and self (re-)discovery. Heavy themes that require a delicate touch. That last part is where things go wrong, but more on that later. As the show begins, we see a boy sitting at home while his female friend is pestering him. The boy's father is remarkably unfazed by what is going on. Soon enough, we learn why. The girl, Meiko, died 10 years ago and is a ghost visible only to our protagonist, Jinta. She's come to him with a request: he has to help fulfill her last wish so she can part for the afterlife. Problem is that Jinta has grown up to be a recluse. Nonetheless, he gathers all his courage and ventures outside. Earlier episodes show Jinta in his attempts to reconnect with his group of old friends to find out what Meiko's final wish could be. The Super Peace Busters (the name of the group) are a colorful bunch, and the series is at its best when it shows them getting back in touch. AnoHana nails that mix of awkwardness and nostalgia felt between people who haven't seen each other for a long time. In particular when they're connected by tragedy. In this regard, the character interactions feel incredibly authentic. And then Meiko comes into play. Meiko, as portrayed by the series, is the most wonderful girl ever. She's incredibly sweet, loving, selfless, wonderful and innocent. Jinta is in love with her, even after all these years; as are the other boys from the Super Peace Busters. And the girls? Their emotional crises are all about how they could never match up to Meiko, even now that she's dead. Keep this in mind: we're referring to a girl who died over 10 years ago, when all of them were around 5. I repeat: this happened 10 years ago. A lot can happen in so much time, especially for children growing up. The death of a friend, tragic as it is, will usually stop hurting quite as much. Life goes on, and day-to-day concerns have a way of catching up. AnoHana doesn't seem to grasp this. Every single person who knew Meiko even the slightest bit is still devastated over her death because she was simply the most wonderful girl ever. The Meiko we can see, however, is an annoying caricature. Her personality is that of ditzy, clingy, ''moe'' characters such as Yui Hirasawa (K-ON!). Her reactions mostly consist of either crying or being incredibly cheerful, and things she does on her own usually boil down to misguided attempts at cheering up Jinta with antics that we're supposed to consider cute. The makers even shoehorn in some fanservice of her. Raising the question of how seriously they really want us to take her. Very seriously, it turns out. The whole plot ends up revolving around Meiko and her wish. By the end it's difficult to remember any aspect about the other characters that doesn't trace back to Meiko in some way. Worse yet, the series spends a lot of its running time having characters doubt Jinta's claims that he can communicate with Meiko's ghost. This in spite of the fact that Meiko is a ghost who can interact with physical objects. That's right. Proving her existence would be incredibly easy and yet the series keeps contriving ways to wring melodrama out of other characters' disbelief. One could defend this by claiming that people in real life don't always go for the best solution and make stupid mistakes. Which is true. But the characters in question are portrayed as decently smart in spite of their issues so it feels strange that such an easy to solve problem is dragged out for so long. Worse yet, the actual narrative ends up pointing this out. Indeed, the series itself pokes fun at how long it took to solve its nonexistent problem. It would be cute if it wasn't so infuriating. Sadly, the frustration only gets worse from there. As the series culminates in an ending that's composed and executed with such bombastic melodramatic sincerity I almost felt bad about laughing at it. The climax basically abandons any pretense of subtlety in favor of having characters shout their feelings at each other, only to neatly wrap up their issues with an instant-cure group therapy session. If only it were that easy in real life. Real grief, of course, is a totally different beast. It's not something you get over after a miraculous event. Rather, it's a constant uphill battle as you struggle to pick up the pieces and try to fill the void that's appeared in your life. The way AnoHana presents a one-size-fits-all solution is hopelessly naïve, however well-meaning. That last bit is a great way to sum up the series in a nutshell. Its superb presentation and handful of interesting parts are ultimately wasted on a series that decides to focus on all the wrong things. Pandering, sentimental and ultimately frustrating. ''Ano Hi Mita Hana no Namae o Bokutachi wa Mada Shiranai'' is a crushing disappointment. The ideas I have formed about the themes explored in this series are based on my own imagination and second-hand accounts of people less fortunate than I. Should you disagree things I have written in this review then please do not hesitate to write me a message. I apologize for any offense I may have caused and wish to explicitly state that it is in no way intentional. There’s nothing quite like the loss of a loved one for changing a person. We always feel that death is such an alien concept, it exists but is somehow detached and unrelated to our own little world until it comes knocking on our doorstep. Ano Hi Mita Hana no Namae wo Bokutachi wa Mada Shiranai (We Still Don't Know the Name of the Flower We Saw That Day), tries to show us just how powerful an effect death can have on us. The keyword is ‘tries’, and for the most part, AnoHana succeeds. It is one of those anime that illustrates perfectly the idea that the relative distance to perfection is inversely proportional to the obviousness of huge, glaring flaws. For everything that AnoHana does just beautifully right, there is usually something little it gets horribly wrong. Before we go on, I would like to state for the record that I absolutely endorse this anime to anyone who asks, reasons which are perfectly illustrated in Archaeon’s neatly succinct review, of which I direct you to. There really is no reason to write another straightforward review reiterating everything he's said when you can just go and see his. Instead, for those who have already finished the anime and are looking for a more critical approach to viewing AnoHana, it may interest you to read further here. There’s no denying AnoHana is fine piece of work. Everything from animation to sound, characterization to story are all quality material and together form both a visually and emotionally satisfying experience. The anime is far past the point of debate about whether watching it would be enjoyable and worth one’s while, because it most certainly is. The proceeding point of scrutiny would be to examine the anime at it’s core fundamental level. This is the point where the ‘really good’ pieces of work are separated from the true masterpieces. This is also the point where AnoHana unfortunately falls flat. Specifically speaking, AnoHana’s screenplay just isn’t very good. In fact, considering how well rounded the anime feels as a whole, the screenplay is actually deceptively and surprisingly bad. Okada Mari, one whom I respect greatly for her work on Tordora and Kuroshitsuji is back again; this time she is chief script writer for AnoHana. Unfortunately Mari’s apparent inexperience in writing shines through clearly in the screenplay. There is no doubt she has talent and a knack for good ideas, which makes it disappointing to see she still stumbles on some basic areas of writing. The narrative for example, is sorely lacking in woven exposition, with the many aspects of the story left feeling one dimensional and underdeveloped (more on that in a moment). There are very clear distinctions between the lines that have significance to the plot or the character, and lines which are simply conversational pieces, with almost no blending of the two types. At times it feels like the latter lines have no contextual meaning at all and are simply there to fill in time because the script writer couldn’t think of anything else to write. For an anime like AnoHana where the entirety of the narrative is delivered via dialogue and character interaction, this is a very dangerous habit to fall into. There are many good things that Okada Mari brought from her experience working on the series compositions of titles like Toradora, Fractale and Gosick. Unfortunately one of them also happened to be the abysmal pacing that they all suffered from at one point or another. Naturally, the structure Exposition-Rising Action-Climax-Falling Action-Resolution can’t possibly be adhered to as strictly for anime as it does for say, novels or films, simply due to the episodic nature of anime; there is an underlying need for each episode to be standalone in it’s own right, even if it is meant to contribute to the overall story. However that isn’t to say we shouldn’t at least make an effort. I am strongly hesitant in calling AnoHana a melodrama. The constant hint of realism in both the visuals and characters suggest otherwise, as does the very real themes that it tries to convey. The anime obviously works very hard to provoke an emotional response and I wonder at times if it is trying a little too hard. Not a scene goes by without Yadomi frowning at something, and the prevalence (or rather excess), of falling tears in every episode almost screams at me: “Here is an emotional scene, indicated by the tears. Feel sadness you sheep!” The need for AnoHana to constantly use the act of crying to convey sorrow seems almost shortsighted, and while they are a good tool for reinforcing the emotional instability of the characters, they seem to serve little other purpose. All this cumulatively leads to the biggest flaw of AnoHana: as an anime observing death and how people cope with it, there is shockingly little character development observed. What AnoHana tries to offer instead are single characters at two points in time. On one hand we have the happy-go-lucky childhood of the super-peace-busters, on the other we have the sullen, withdrawn adolescent individuals of those friends, drifting apart and trying to move on with their lives. At first sight it is amazingly easy to mistake this contrast of past and present for ‘character development,’ however true character development demands something a little more in-depth than, ‘friend dies, people become sad.’ Yukiatsu is arguably the only character who experiences true change, *spoiler alert* in his brief contact with Menma *spoiler alert* he experiences denial, confusion, jealousy and anger, and in doing so, realizing his self-loathing attitude and changing himself. Yadomi’s development is also arguable, though I remain skeptic as to whether what seems to me as merely an overdue self realization can be categorized as development if it were there subconsciously all along. In comparison, the other characters, experienced only minimal changes, exchanging confessions and realization which, while heart-moving, can hardly be justified as ‘development,’ begging the question of whether there was any point to the whole thing other than being an emotional roller-coaster of adolescent diversions. If you’ve managed to read this far and haven’t yet ‘unhelpful’d’ this review or thrown your mouse across the room in anger, then props to you, and perhaps you’d like stay a bit longer and allow me to explain where all this nonsense is coming from. The mindset of a critic is slightly different from that of an average viewer. We’ve seen, considered and analyzed far more than what would be considered healthy for a normal human being and as a result, we view things a bit differently. Cliches and archetypes you’ve seen maybe half a dozen times, we’ve seen hundreds of times. We get bored quickly, we’re more easily dismissive, we hone in on small mistakes like vultures, we’re very excited by originality and we’re far more disappointed when a promising series falls short just inches from the finish line. Nine out of ten times, the things we watch are mediocre at best. Stuff that’s so average that it takes all of our willpower just to struggle through a normal review; talk about some story, mutter about some character, drag on about some animation and call it a day. But then something like AnoHana comes along, something new, something exciting, something to sink our teeth into. We may end up enjoying it, we may not, but the fact that it had piqued our interest meant it had already established itself as something special, something good enough to be able to be improved upon in the future, something we WANT to spend time thinking about, something actually WORTH criticizing. Think of this review not as a “everything that was wrong with AnoHana” review, but as a “AnoHana was this close to being a true masterpiece, I found myself taking time out of my busy schedule to watch it twice and write up this critique, if only it had improved on these points, I might have given out my first ever 10/10" review. In fact, consider this review a praise by exception, in that everything I DON'T mention is absolutely friggin' brilliant. That's a LOT of stuff. "Oh no, here come the tears!" Anohana was a fantastic, emotional story of loss that struck all the right heart chords. Anyone who has abruptly lost someone premature in their lives can relate to this series. What it does, it does very good in fact... And I really started empathizing with the characters like I knew exactly what tragedy they had gone through. All of the characters and their motives were believable, and it made for one enjoyable experience. Although Anohana only had 11 episodes to get it's point across, I had no problem understanding any part of the plot. Six kids, inseparable it seemed were devastated when one of them was tragically killed in an accident. Now they all gather back several years later to attempt to send off the memory of one of their best friends by granting an eternal wish. The exact details of Menma's death were never explained, but it was unneeded. The writers did an incredible job of making that information irrelevant. The subject was so sad to even talk about, the characters all got fragile when they started talking about it. I can't help but think the writer had some personal tie to a similar situation like had transpired in the series. It seemed so gripping and personal to me. Especially near the end, none of the characters wanted to let go of the memory they had of Menma, and often had trouble coming to terms with their own personal guilt. I'll just say it takes a lot to make me cry, but at the end as the closing theme played, I lost it. Incredible, original and emotional storyline. Like I previously stated, all of the characters in Anohana were believable... and it made the show that much better. The main, Jintan struggled constantly between wanting to move on and wanting Menmas memory and love to stay with him forever. He is obviously stricken by what had happened that day, and leads a very closed off life because of it. However, Jintan opens up more and more as the show continues. I love the growth he had even through such a short amount of time. Poppo reminds me a lot of myself. He handles grief by putting on a "everything is ok" façade, which the others mistake for him just being a goofy individual. Deep down is more than likely a sad grieving man desperate to make amends with his regret from that day. Yukiatsu kind of rubbed me the wrong way, but his character was still strong and understandably jealous of Jintan. The only strange thing I thought about the characters were how they all filled in a strange love triangle of sorts. I felt it was unnecessary to write in love interests of 10 year olds... And after years later their feelings were all still so strong. A bit odd. The animation was very good in this series, but nothing buzzworthy. I thought it was a little strange how they made Menma age, but still not quite as much as everyone else. I'm not sure what the artists were going for here. The opening was also alright, but didn't feel as as fitting as the ending song (which I felt was very good). Especially how it was incorporated into some of the episode's conclusions. I think it's safe to say that after all of the action animes I've seen recently, it was really nice to see Anohana. Even with as blubbery as I was at the end, I felt it showcased the feeling of loss and grief to the best extent possible. I would recommend this anime to just about anyone, especially those who enjoy heart-felt stories. Loved it! I'm actually kind of shocked after reading these discussions how many people don't like the show.